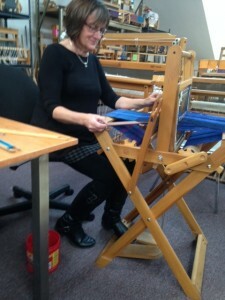 Last night I took my first weaving class. I spent two hours at The Chicago Weaving School (Irving Park and Keeler) learning beginning weaving in a one-on-one session with owner, Natalie. The school is a large storefront filled with over fifty looms of all shapes and sizes. Four small floor looms were “dressed” in various colors, ready to begin a project. 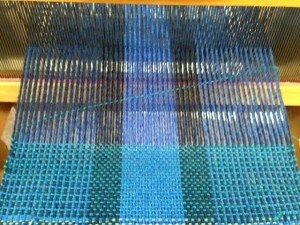 I chose one with two shades of blue warp threads. 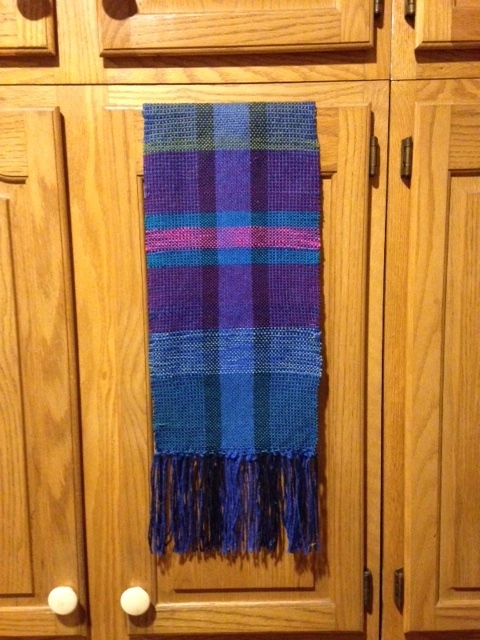 She introduced me to the vocabulary of weaving; to warp, weft, shuttles, draw, heddles, harnesses, reeds and so on. Mostly, she let me play. She brought me a huge basket of yarns and had me wind a shuttle with my choice of color (green.) I sent the shuttle back and forth about forty times before she stopped me to show me how my edges were drawing in. She taught me how to leave the weft yarn at an angle so that when the beater bar pressed it in place, it had enough extra give to go through all the warp threads without pulling too tight. 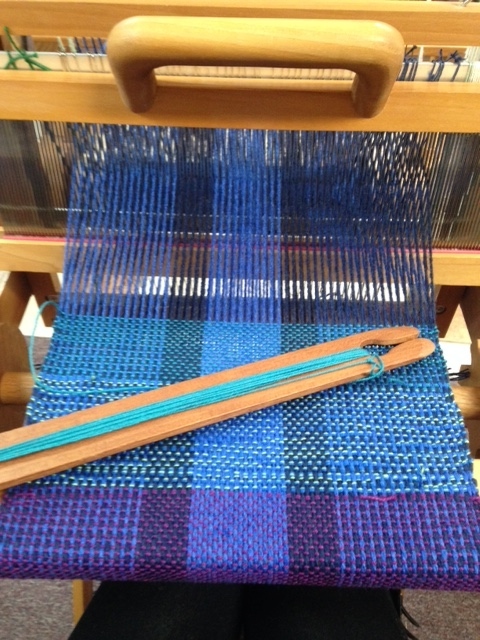 I wove a basic weave on a two-harness loom with foot pedals. The right pedal lifted the every other thread up making a “shed”, a triangular opening for the shuttle. The left pedal brought the alternating threads up, again forming a shed. 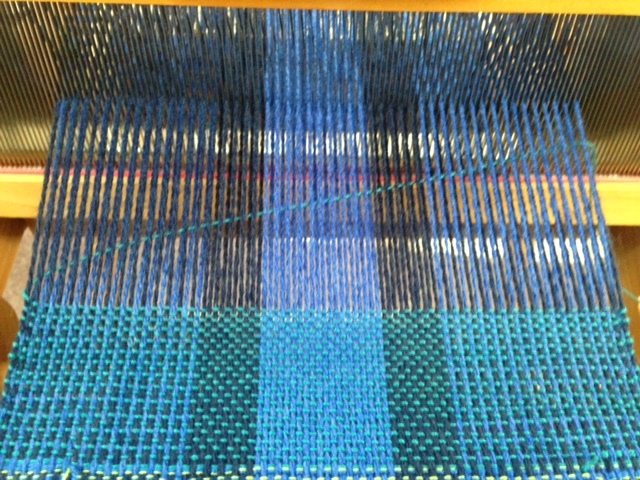 By alternating the pedals, I was weaving a basic in-and-out pattern of over/under one thread. On a more complicated loom that pattern can vary more. 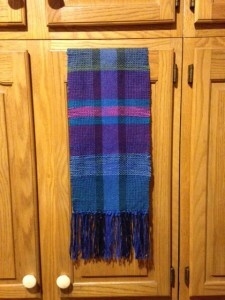 I tried different colors–green, bright green, purple, aqua, and a mix of two threads (blue/green). It was really interesting to watch what different colors did to the overall design. You’re amazing. Life long learner will always keep you sharp. And I love the colors! Very nice finished product. This is something you can now add to your ‘talent’ list and will be a nice alternative to quilting. In an admission of frank jealousy, how can anyone be this good on their first try?!? It’s beautiful!! !